John says, "Unfortunately this is a poor quality image, but it is a fascinating scene. I suspect the location will be difficult - the only legible lettering is "Gentlemen". The building for gents is an unusual design, and the line curves to the right out of the station under what I think is a road bridge. I have never seen two Jumbos or any other LNWR locos working tender to tender - did this in fact happen much? The lead engine has had someone putting in a lot of effort to burnish the chimney rim. The shed plate on the train engine is not legible. The train looks to comprise an open wagon and a 3-carriage set of 6-wheel stock with a brake at each end. What was going on?" On my print which is an original LPC, and therefore probably as good as is available, I can see no more than John, except that in the far distance there appears to be a second overbridge. It was not unknown to haul 'dead' engines on certain types of trains to Crewe and thence to the works, and as Crewe at this period (presumably pre- WW 1) also repaired coaching stock, the whole ensemble could be en route for the works. As to location I seem to remember many years ago someone on seeing the print saying it was in the south Manchester area or between that city and Liverpool. This is very tricky. The date appears to be after 1903 as the engine has a centre lamp socket. There is one headlamp over the right-hand buffer, which signifies "Light engine, or light engines coupled together, engine and brake van, or bank engine". The plate on the cabside seems unusually large, but no Jumbos were "Engineer" at that time. I think this is probably a special engineer's train, and is definitely not a three-coach train of six-wheeled passenger stock. I have no idea why two engines were required. The first vehicle is not an open goods wagon, but what probably is (or was) an Open Fish Truck (vacuum brake fitted). A step has been fitted to the headstock, presumably to assist mounting from rail level. As far as I can see it is attached to a wooden framework which seems to be a mock-up of the profile of a 9ft 0in wide high roof carriage. So possibly the outfit is engaged in gauging trials to test whether such stock could pass over the line. This in turn suggests the Bletchley District (i.e. 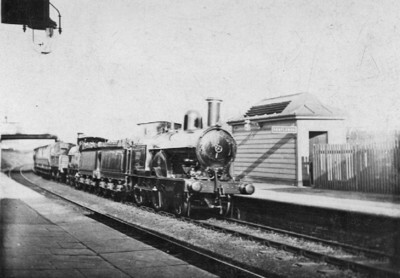 Oxford - Cambridge line) as prior to December 1907 the coupled-train bogie sets were cove-roof and 8ft 0in wide, but thereafter high-roof 9ft 0in wide stock came into use. If this is so then the date will probably be early-mid 1907. The second vehicle is a 32ft 0in x 7ft 9in brake van. It is probably an early example dating from 1879-82, and recently supplemented and transferred to departmental use. It retains the lower footboards, again suggesting a date before about 1908. The third vehicle is mostly out of sight around the curve, but has large square-top ogees suggesting a 30ft 6in x 6ft 10in brake van dating from 1874-9, again certainly transferred to departmental use by this date. The gents' toilet has a vaguely Bletchley - Cambridge line look to it, although I am not able to match it with any photos in my possession. This one certainly is very tricky. The shadow of the 'Gentlemen' board along the side of the toilet building, which is about 20ft long, means a low sun, so if the photo was taken in the afternoon or evening the camera is pointing more or less due east. Or of course, if taken early in the morning, pointing west. Whichever, this rules out many stations. The curve of the track and the overbridge(s) limit the possibilities further. The gents' toilet seems to have been a standard LNW pattern in the 1880s, and maybe earlier if that is a zinc roof. Photographs show similar but slated-roofed structures at Walsall (1) and Castlethorpe (3), but this isn't at either of these stations, so that gives five examples seen - so far. The date seems to me to be 1895-1902. I don't see a middle lamp socket; those on the left and right are sunlit and quite clear, as the middle one would be if it were there. In front of the tender toolbox the bottom part of the communication cord support bracket can be seen. The curved upper part seems to have been wiped away, together with the engine whistles, by an overenthusiastic retoucher, but perhaps the rear curved bracket can just be made out against the dark interior of the second engine's cab. The numberplate appears to be normal size, measured against the sidesheet, so the loco isn't an "Engineer". To judge from the shadows, the station buildings don't seem to have canopies extending to the platform edge. The dark item at the top left could be a triangular board perhaps bearing the words "Way Out" or some such; the lamp glass has a station name - unfortunately illegible, but perhaps ending with "D". The front engine appears to be a Waterloo class, as the splasher doesn't reach the rail, but has a curved stay between. This might (or might not!) mean we are in the north. The number plate appears to match the spacing for a normal plate, so doesnt need to be an engineer plate.